Top Right: This is a Phase I Hydrogeologic Siting project for a proposed de-centralized wastewater treatment facility in west Mobile County. In a Phase I project background information is gathered through research and suplemented with field work to compile a hydrogeologic work-up of the project site. As a preliminary form of investigation, Phase I projects can identify positive or negative aspects of the target site before moving forward to more advanced planning. In this photo, OAI is on-site to obtain shallow lithologic information and groundwater data via a drilling rig equipped with hollow stem augers. Top Left: This is a photo of a finished de-centralized wastewater treatment plant at a west Mobile County C-store. OAI assists with permitting these facilities through preparation of Phase I Hydrogeologic Siting Reports as well as with follow-up monitoring work required under the permits. OAI has completed Phase I projects for 19 such wastewater plants. Middle Left: This is a photo of the wellhead for the second well in a 3-well, 2-aquifer wellfeild planned, tested, designed and permitted by OAI. This project produced significant savings for the utility by: eliminating the need for two treatment plants, reducing ~10,000 feet of piping to ~1,000 feet of piping, reducing land purchase costs, eliminating the cost of two test wells and increasing "site" production from 1 to 2.8 million gallons per day. The photo of this wellhead virtually respresents the "capital costs" to bring an additional million gallons of groundwater per day on-line. Lower Left: It's not all work and no play at OAI. This is a photo looking out of Dan's room while he was attending the 3rd International Conference on the Analytic Element Method in Modeling Groundwater Flow. The conference was held at Gull Lake Resort in Brainerd, Minnesota. OAI makes the effort to continue our education on the lastest advances in hydrogeology and then puts that knowledge to use for our clients. Through research, conferences and study, OAI remains a step ahead. 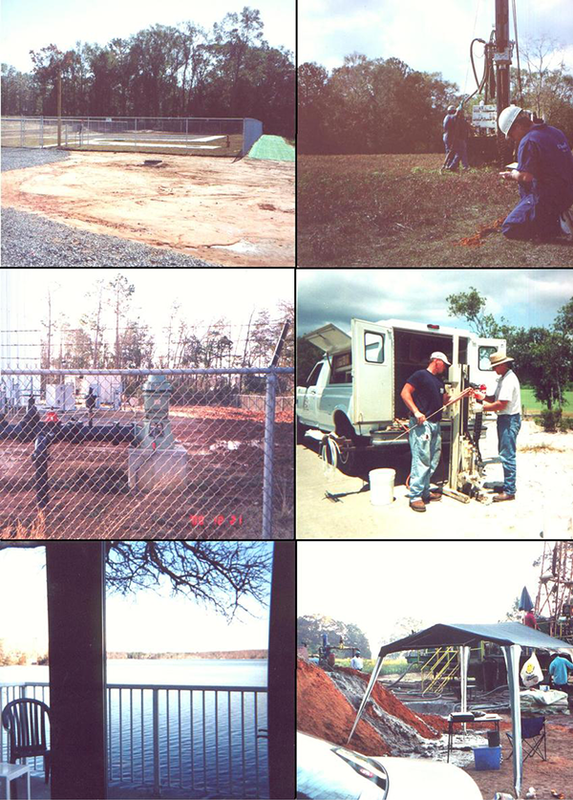 Lower Right: This is a photo of OAI's "mudlogging" operation on a exploratory bore for a new public water supply well. OAI's mudlogging training and experience orginated in the "oil patch". Muddlogging by an experienced and trained geologist is an invaluable tool for use in groundwater exploration and can be the difference that makes or breaks the decision to plug a test bore as a dry hole. OAI has mudlogged 30,000+ feet of water well bores to depths of 1,500+ feet. Middle Right: This is a photo of a saltwater intrusion study OAI conducted for a coastal client. The direct push technology used on this project was selected because it allowed for rapid collection of groundwater quality data while minimizing the disturbance to the client's operation. Saltwater intrusion can be a significant problem when groundwater extraction exceeds groundwater recharge in aquifers adjacent to brackish or saline waters. OAI has completed numerous coastal research and well permitting projects where the potential for saltwater intrusion was a factor. Our carefully planned and implemented approach to coastal groundwater exploration provided our clients with the infromation they needed to make informed decisions with respect to their groundwater needs. Whether it involves evaluation of your existing coastal groundwater resource, simulation modeling of groundwater extraction over time with respect to saltwater intrusion, permitting a new coastal groundwater well or protecting your groundwater supply, OAI is the one to call.